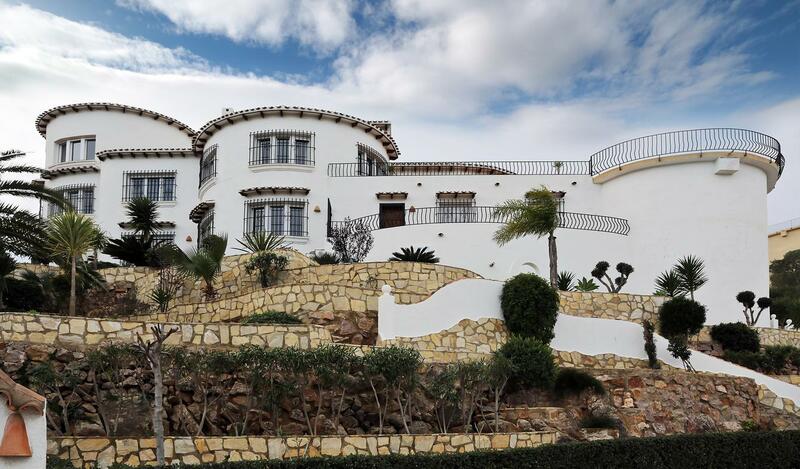 Magnificent luxury villa with a total built area of ​​413m2 located on a beautifully plot of 1453m2 and offering incredible panoramic sea views. The house has magnificent volumes spread over 3 levels but the main living space, the terrace and the pool are on one level. This main space includes: an entrance hall a large living / dining room with fireplace, exposed beams and sea views a second living room with fireplace a large fully equipped kitchen with dining area and direct access to the terrace a double bedroom en-suite with wardrobes and bathroom a double bedroom with wardrobes a double bedroom used as an office a bathroom with bath and shower the staircase of the tower leads to the fourth double bedroom with sea view, dressing room and a bathroom with double sink and toilet From the living room and the kitchen, you reach the beautiful terrace with its large swimming pool of 10 x 5 meters with a breathtaking view of the sea. The covered terrace allows you to enjoy a shaded space. The terrace also has a summer kitchen and an outdoor shower. From the living room, an interior staircase leads to the guest area, which consists of a large living room (with the possibility of creating a kitchen), two bedrooms and a bathroom. There is an independent access from the terrace adjoining the living room of the apartment. The Mediterranean garden is irrigated by an automatic watering system for easy maintenance. The property offers very high quality equipement such as: air conditioning and central heating, swimming pool 10 x 5 meters, electric gate, double garage, double glazed windows, security grilles, fully fenced plot, large shaded and open terraces, satellite TV, internet. It is sold furnished. You will also appreciate its perfect orientation which allows to benefit from an optimal sun all the year. The residential area of ​​Monte Pego located on the heights of the protected natural park of Marjal is 10 minutes from the sandy beaches, the golf course of Oliva Nova and its international equestrian center and 20 minutes from the golf course of La Sella.